Since I started reviewing FTP clients I've had a few requests to look at a few different FTP clients, and I've managed to analyze a few of those clients in my blog. A few weeks ago I had a request from one of my readers that really caught my interest - Shabbir Talib contacted me through my blog and asked me to review the Kermit FTP Client. I found his request especially appealing because I used to use Kermit before the public learned about the Internet; back then I was using Kermit to access dial-up Bulletin Board Systems (BBS's) and to connect to my college's VAX system. That being said, I hadn't used Kermit in years so I couldn't resist taking a look. I need to stress here the Kermit is actually a full suite of connectivity applications, the Kermit FTP Client is only one part of that communications suite. So from the outset the Kermit is more than overkill if you're just looking to transfer some files to and from your FTP site. The Kermit Dialer takes the place of what most FTP clients would have as a Site Manager, and opening that application will display a large number of templates for various connection types. Rephrasing my earlier statement, saying that Kermit is overkill is really an unfair assessment when you consider the sheer number of options that Kermit gives you. If you are used to creating and configuring FTP site connections in most FTP clients, you generally have a small handful of options that you can specify. This is not true for Kermit 2.1.3 - the wizard for creating a new FTP connection in the Kermit GUI led me through eleven wizard-based pages of options before the connection was created. Once you connect, however, the Kermit GUI is just a wrapper for command-line FTP functionality - so you have to know what you're doing in FTP to get around, and there is no explorer-style functionality like you get with graphical FTP clients like Core FTP or FileZilla. From what I've seen of Kermit's scripting support, this appears to be an extremely rich feature for people that need more options for scripting an FTP client. 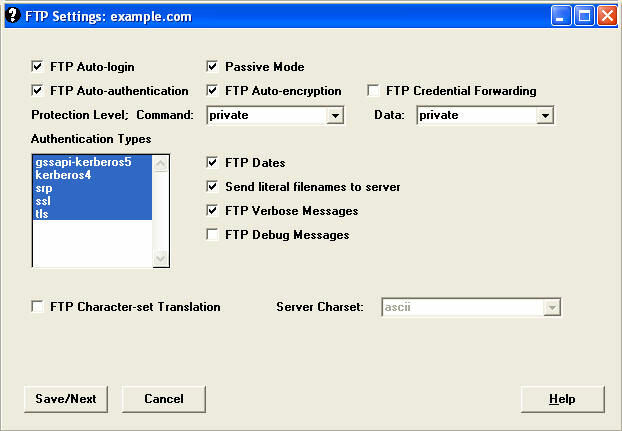 The Kermit FTP Client supports FTPS, and it allows you to configure options such as separate protection levels for the command and data channels for a connection. Once you have the security options specified for the connection, connecting to an FTP site using FTPS is pretty straightforward. That being said, FTP7 virtual hosts are supported by using the "ftp.example.com|username" syntax when specifying your username, and when you connect to the FTP7 server it will route your requests to the correct FTP virtual host site. Note: You need to send the HOST command before sending USER and PASS. 1 As noted earlier, true FTP HOSTs are available when using the "ftp quote HOST ftp.example.com" syntax. Note: Keeping with my standard disclaimer, there are a great number of additional features that the Kermit FTP Client provides - I'm just keeping the focus on those topic areas that apply to FTP7.